Classroom and school discipline can be the toughest part of any teacher’s or principal’s job. Even though discipline problems can dominate many school days, teacher training tends to be focused 80% on content and a mere 20% on behavior management and discipline. Many teachers and principals report receiving even less instruction on discipline, and student classroom management and behavior problems are often cited as the top reasons that teachers leave the profession entirely. In our Breakthrough Strategies to Teach and Counsel Troubled Youth professional development workshops (coming soon to Seattle on May 4-5, 2017), we devote hours teaching you how to have excellent student behavior management. It is also most definitely one of the most requested topics that our workshop participants ask us to cover. 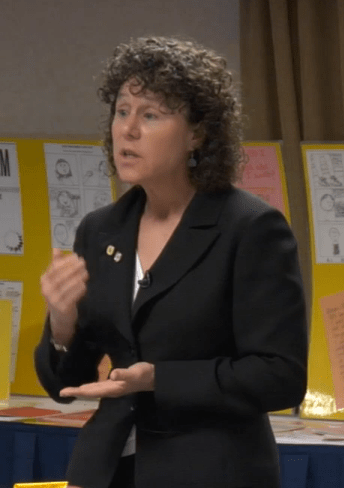 I’m the Breakthrough Strategies Workshop instructor, Ruth Herman Wells, M.S. In this article, I’ll give you a peek into some of the top strategies we offer in our professional development inservice sessions. While this is certainly not a comprehensive article, it has some of our best tips to get you started on the path to successful school discipline. If you need more than the sampling of ideas briefly covered in this short how-to article, consider signing up for our Seattle Breakthrough Strategies Workshop sessions on May 4-5, 2017, where we will provide a whopping 200 interventions, all designed to produce successful classroom and school discipline. Many of us– whether young or old– fail to reliably follows rules and policies that we find to be unreasonable. Many very reasonable classroom and school rules are viewed by students to be totally bogus, and they act accordingly, and discipline suffers. To improve compliance with school and classroom rules, convince your students of the importance of those policies. Here is a fast and memorable way to accomplish just that. Remember: students who see value in the rules are far more likely to reliably follow those rules. This strategy is a role reversal and many students can be offered the opportunity to participate in it. Ask one of your students to become the role play teacher. You may wish to choose a student who normally resists or ignores school or classroom rules. Offer the student a great prize in lieu of the paycheck that teachers earn. The prize can be anything that is enticing, such as getting out of class a bit early, or soda pop, or stickers, or whatever fits your age group. To earn the prize, the role-play teacher merely needs to teach the class to remember a 5 digit number. Sounds so easy, doesn’t it? But, this is a classroom with no rules. Even worse for the role play teacher, you’ve distributed a lot of the things you don’t want to see in class, items like bubble gum, snacks, cell phones, etc. If necessary, you can also prime several students to engage in other problematic behaviors like talk outs, being out of their seat, and so on. The role play teacher attempts to teach your classroom and quickly discovers that it’s impossible. With your prompting, encourage the role play teacher to set rules, and attach the role play teacher’s name to the rules. Next, have him or her write the new rules on the board. After a while, retire your first role play teacher and give other class members a chance to experience teaching in a classroom without rules. Once enough students have gotten to experience the extreme difficulty of trying to teach in a class without rules, discuss whether there just might be values in rules. Not only will students view the rules differently, they are far more likely to follow them because their names are now attached to your classroom rules, and they are the ones that created those rules. Students are unlikely to hassle rules they created and named. You will be delighted at the difference in your classroom and school. Many educators believe that if they simply have big enough consequences for school and classroom rule violations, that those sanctions are the way to ensure successful discipline. Sadly, that assumption is often completely wrong. If I say to you that unless you start speaking Swedish right now, you are going to face terrible consequences, most people in the U.S. still can’t speak Swedish. When you say to your students that if you engage in problematic conduct, you will face big sanctions, that is really no different. If you want to excellent student behavior management and discipline, you must teach the behaviors that you expect– and also motivate students to see the importance of complying with the expectations, as discussed above. The clearest illustration is to look at your rules regarding the use of violence. Students who grow up in a violent family, for example, may have no idea how control their fist, mouth and actions. At home and in their neighborhood, using their fists may be commonplace, and consistently using more socially acceptable behaviors may be unfamiliar and seem undoable, just like you speaking Swedish on command. To expect a consequence to compensate for that deficit is naive and unrealistic, yet that is often what happens when schools expect students to magically change their behavior just because a heavy duty consequence can result. If you truly want student conduct to be better, you are going to have to teach those specific behaviors in an organized, step-by-step manner, very similar to the way you teach specific academic subjects. Further, just as you would never expect a student to magically or instantly learn calculus or to read, students can’t suddenly master self-control behavior skills. Pictured above is a sample student worksheet that teaches acceptable behavior instead of aggression. It is from our Temper and Tantrum Tamers lesson book. Our website has thousands of resources that teach students self-control but our books, live professional development inservice workshops and online courses are your best bet. First, if the classroom has really been quite out of control, it is usually far easier to start over than to clean up the existing situation. So, you will need declare Room 630 History Class or Mt. Vernon Elementary’s 3rd Grade Room 50 done and gone. Rename the space and start over. However, you must be able to re-start incredibly strong and firm or you will quickly find yourself back where you started. Second, to avoid ever getting into this situation at all, we always recommend you start your school year being way too firm and strong in how you manage students. If you decide later to ease up, no student will fight you. However, if you start off a bit weak, indecisive or you are easily played by students, I can guarantee that you will not be able to easily– or perhaps ever– tighten up as students will fight hard to maintain the chaos, commotion and disruption that has become the standard. When you re-start, you must acknowledge the problems that occurred, clearly state what will be different, and then make sure that the new version of your classroom is firmly managed, with strict consequences, along with regular training that shows students how to meet behavior and discipline expectations. You will also need to motivate your students to see the value in school and education because a motivated student is far less likely to fritter away their education on misbehavior. Poster #471 (shown at right) is just one of our thousands of motivation-makers that transform kids into motivated learners. Our live conferences, online professional development seminars and books all can guide you because Youth Change Professional Development Workshops is your school discipline and behavior management expert. We are your classroom management authority, and we specialize in preventing and fixing serious, persistent behavior management problems. We’re here to help. You can email us here. We have strong registration for our Seattle, May 5-6, 2016 Breakthrough Strategies to Teach and Counsel Troubled Youth Workshop but we are very much in need of helpers. Normally, we charge $84 to attend the workshop as a helper but if you would like to attend FREE and help out with the event, we need you. Please call 1.800.545.5736 to sign up and learn how easy it is to be a workshop helper. You can earn optional college credit or 10 free clock hours while learning 200 awesome, new strategies to turnaround problems like defiance, work refusal, tardiness, bad attitudes, apathy and more. We have just a couple slots to give out so call now. This offer is not available to people who have already registered or have a registration in process. As our world goes more and more high tech, your students need to be ready. There are a lot of fantastic strategies in this issue, and all of them help prepare youngsters to live in a wired, wired world. Students who face barriers, challenges, family problems, crisis, or other concerns, are especially vulnerable to online danger. Hello from Youth Change Director Ruth Herman Wells, M.S. The picture on the right shows me teaching one of our many online professional development courses— just one more part of the real world that has gone cyber. This issue of our online magazine– yet another cyber entity– is packed with strategies and activities to help keep your students safe in an increasingly wired world. It is easier to stay safe in cyberspace when you have learned at least the basics. Girls sometimes can feel that tech is for boys. The relatively low rates of girls getting involved in STEM classes is a clear indicator of a trend that sadly continues into the workplace where women are often woefully underrepresented. Use humor to combat the stereotypes that girls can have about tech. This activity focuses on a very funny worksheet for girls and young women. It humorously overturns many stereotypes about girls and tech. You can download the activity worksheet on our website and print it for use in a discussion with female students. The worksheet can also be printed as an 11" x 17" poster, free to you for being a subscriber of this internet magazine. Stranger: So do you want to meet up later? Stranger: Do you want to come over? Print each conversation on one side of the page. On the other side, in big letters, put either "Good Guy" or "Bad Guy." Be sure that some conversations, like the one above, are relatively clearly reflecting a Bad Guy. Have other conversations that are more neutral, and some that appear safe but all/most should ultimately show Bad Guys in a way that conveys that "strangers online mean danger online," a phrase you can ultimately write on the board and discuss with students. Tech-averse students may not fully understand how difficult adult life will be without cyber skills. This activity can convince them to acquire more critical, basic tech skills. Inform students that nearly all jobs have a high tech component, from clocking in on an electronic time card system, to operating a PDA, to using a barcode scanner, so they can discover that more and more work increasingly includes technology. Put two columns on the board, then ask students to list jobs not normally associated with high tech. Put their responses in the first column. Next, ask students to name how each low tech job might still require high tech skills. Put their answers in the second column. For example, waitresses may need to use smart phones and tablets to key in orders, scan credit cards, and tabulate bills. Another example: Baggage handlers at airports have to scan luggage tags and navigate through complex computerized security systems. Assist the class to realize that almost all jobs require tech skills because we are increasingly living in a high tech world. Write the word "cyberbullying" on the board, and ask students to discuss what the term means. Assist students to identify strategies to cope with, reduce, or eliminate the cyberbullying they may experience. For example, students can block bullying "friends" on Facebook. Give this guideline to help students recognize cyber bullying: "When it's no longer social networking but has become anti-social networking, that's cyberbullying, and means it's time to find a new network." This intervention activity helps students realize that problematic postings can come back to haunt them forever. Begin by asking students what kind of content is posted on Facebook and other social networking sites. Allow them to note that students sometimes post about partying, substance abuse, personal problems, and so on. Next, ask the group who views the content. Assist students to realize that content may be viewed by colleges and universities, and that some colleges, universities– and even employers– are requiring candidates to give them access to all their social networking pages prior to being accepted or hired. Help students to realize that problematic posts can negate the value of good grades when it comes time to be accepted at college, or hired for a job. Ultimately, you can help students see that hard work in school can be instantly destroyed by problem social media posts. You can call this phenomena "Grades by Facebook." School counseling is a tough job to do. As a school counselor, you must be ready to help with virtually any social, emotional, family or academic problem that can arise. School counselors cover it all, from bullying to depression, from domestic violence to drugs, from college planning to mental health issues. School counselors see plenty of the mental health issues that are tough to manage. However, talking to kids about death can be a task school counselors face at least once or more each school year. Having that conversation probably ranks pretty high for difficult, delicate subjects to focus on with children and teens in school counseling sessions. There's certainly the potential to ease or avoid pain, to enlighten, even elevate a child, but there is certainly the potential to confuse, worsen or cause pain, or even frighten or damage a youngster. Hello from Ruth Herman Wells, M.S. I am a national expert on helping troubled and challenged children and teens. I have written dozens of books, am an adjunct professor for two universities. I also write a column for a national print education magazine, and I train thousands of teachers, counselors and parents annually throughout North American. I also raised two children who turned out to be a social worker and a special ed teacher so I guess I can walk the walk and not just talk the talk. School counseling is the lifeline for many troubled, disturbed and challenged students. For some of these youngsters, the quality of the school counseling that a child receives can be the single most important force determining whether a child sinks or swims, struggles or thrives. With that in mind, I offer this quick how-to guide to use in counseling, teaching, parenting and elsewhere. One of my specialty areas is helping children and teens cope with loss. The truth is that children are not uniform creatures and there is no one single right way to talk to a child about death and dying. Having said that, I can offer a few guidelines that are easy for adults to remember and use. I have crafted these how-to steps to be useable by school counselors, teachers, juvenile court staff, social workers and other professionals but these tips have been written to be readily accessible by parents and non-professionals too. First, use actual life events as your jumping off point rather than mechanically or artificially stage a conversation. Parents can start the conversation as young as they wish, but around 2 years old is a general suggestion for where to start. So, Mom can say "Please don't stomp that bug because he could end up dead," and then be ready to explain what "dead" means. The explanation of "dead" must be concrete enough that a small child can understand it so pairing the discussion with the concept of "all gone" works great. Use an object and hide it to teach "all gone." Second, don't worry too much if the child gets the concept of death the first times it's discussed. You're building up to the a more complete understanding as the child ages and develops. Ideally, Moms and Dads should let the child take the lead, and seek questions that should be gently answered. This is an incremental process. If a death occurs in the life of a young child before the concept has been successfully communicated, then aim to give pieces of the concept bit by bit. Give too much and the child will get overwhelmed and their brain can stop absorbing new information on the topic. Third, children's brains aren't fully developed so abstract, non-concrete concepts can be confusing. Let them use their frame of reference like having a "ghost dog" that a child imagines after the death of a beloved pet. Creations like "ghost dog" are completely normal and actually quite helpful. It takes the whole huge idea of death– something even us adults struggle with– and cuts it down to be a bit more pint-size. Parents can help their children think up their own creations to bridge the gap if their children don't devise their own "ghost dog." For example, a child might create drawings of the departed pet as a way to remember it, and let it "live" on– if only as their picture on the refrigerator. Fourth, older children and teens do grasp the concept of death and how finite it is. However their immature brains can struggle to cope when there is a loss. For teens who do have good abstract thinking abilities, the focus should be especially tuned into how the older child or teen is coping. Counselors, teachers, school staff and parents shouldn't just judge the book by its cover, and should be alert for acting-out or more covert acting-in behaviors like substance abuse, self-endangering or problems in school. Finally, loss is part of life, and is just another difficult job that should fall to parents. Waiting to address the subject until the child is older is never a good plan. It will always be tougher for a school counselor to step in late in the game than for a parent to be gently imparting information all along the way. For parents who are unsure of when to introduce talking about death, sooner is better. So long as they are gentle and let the child take the lead, while observing for distress, it is always better for parents to tell the truth about life– even when the truth is tough to take. Chances are you have way too many unmotivated and apathetic students in your classroom again this year. You've probably noticed that conventional methods of inspiring students to care about school, tend to routinely fail, especially with your most unmotivated youngsters. I'm trainer and consultant, Ruth Herman Wells, M.S. As a workshop instructor, I read thousands of evaluations every year. I know that this magazine issue has some of the best student motivational strategies that exist, because that's what our workshop participants note on our seminar evaluation form. Hopefully, you'll agree that these devices are powerful interventions to turnaround even the most unmotivated students. To reach the most students possible, it's critical that you use a variety of styles of intervention. Not all students learn best with their ears, for example. This motivational intervention is geared for students who respond best to active, tactile activities. Intervention: Ask students to create "Grad Mag," a magazine that touts the benefits of graduating high school. Poster #283 provides an example. Students can use conventional art supplies or computers to create their magazine. Prior to starting on the art work, allow students to research the benefits and hazards of getting a high school diploma. They can consider variables like income, type of job, and job status. If a group or classroom of students is involved in this project, students can be assigned to make different components of the magazine, such as the cover, back page, table of contents, and so on. Once the elements are completed, the magazine can be assembled, reviewed and discussed. Indirect motivational methods such as this strategy, may pack a bigger punch than more straight-forward, verbal approaches proclaiming the importance of education and a diploma. While it might be easier for you to present this point of view instead of having your students research and create it, you will find this method to be far more effective, especially with oppositional youngsters. Power up your students to care about school by showing them how automation is quickly taking over entry level jobs, as well as many jobs that have been available to people without a high school diploma. Intervention: To implement this intervention, use a voice that sounds like a robot, or alternatively, record your voice using a device to make it sound robotic. If you search for "make my voice sound like a robot," you'll see plenty of options. Say in a robotic voice: "Any job you can do without skills, a robot can do better." If you prefer, you can substitute the word "diploma" or "math" for the word "skills." Next, discuss with your students why employers might much prefer virtual employees to real ones. Include answers like "robots never have to take lots of bathroom breaks" and "robots know how to do math." Poster #148, pictured at right provides illustration. It may be a sad commentary on our culture, but it is probably necessary to sell and market the value of school and education to students who have not discovered that truth for themselves. If you have disinterested, unmotivated students, part of your job must include convincing those youngsters that school and education will be absolutely essential to their survival. Intervention: If you look at Poster #168, you can see that the word "diploma" is literally made of money. That is a concept that can reach some of your most uninterested students: that schools offer free diplomas that are made of money. One estimate is that high school grads out-earn dropouts by $329,000 per lifetime. Ask your students to estimate what an extra $329,000 per person –$658,000 per couple– could buy. Also ask students to choose whether they would prefer to have $329,000 more or less than everyone else. Don't let students' unrealistic excuses ever justify leaving school. A classic reason some boys offer for quitting school is that they plan to be famous sports stars so they will never need an education. Intervention: Open students' eyes to the truth. 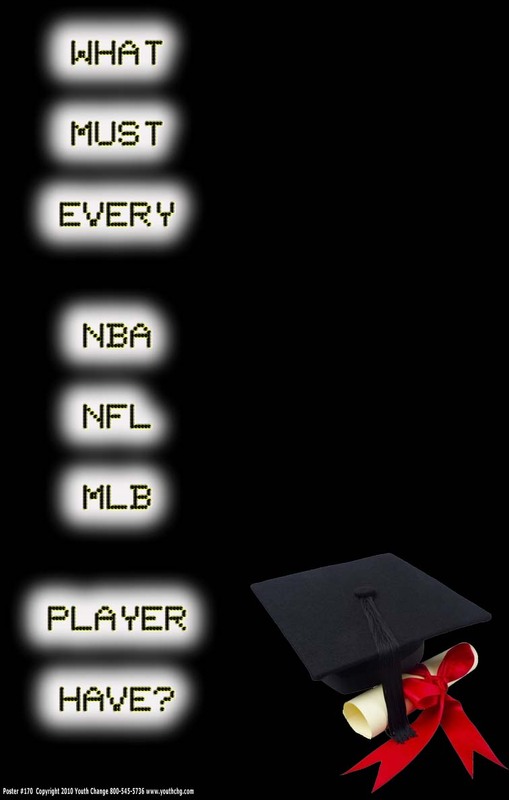 Poster #170 illustrates that the NFL, NBA and MLB all want players to have a diploma. There are plenty of other types of excuses so be sure to confront whatever untrue explanations your students present. In our books, we have interventions for virtually all of these excuses, including "I'm going on welfare," "I'll marry a wealthy man," and "I'm going to win the lottery."